Smooth heating medium flow regulation and supply air set temperature maintaining in ventilation systems with water heating or cooling coils.Compatible with the WKH duct water heating coils and the KWK duct cooling coils. Compatible with all water heating or cooling coils installed in BLAUBOX supply units and KOMFORT air handling units. Connection of the mixing unit to the water heating or cooling coils and to the water heating/cooling network through the pipes or flexible hoses of respective diameter, refer to the technical data table. In case of applying flexible hoses the mixing unit must be rigidly fixed. While installing the mixing unit the motor shaft must be installed horizontally. No mechanical loads from the pipes are allowed. The water mixing unit consists a circulation pump, a three-way electrically actuated heat medium control valve and a recirculation pipe. 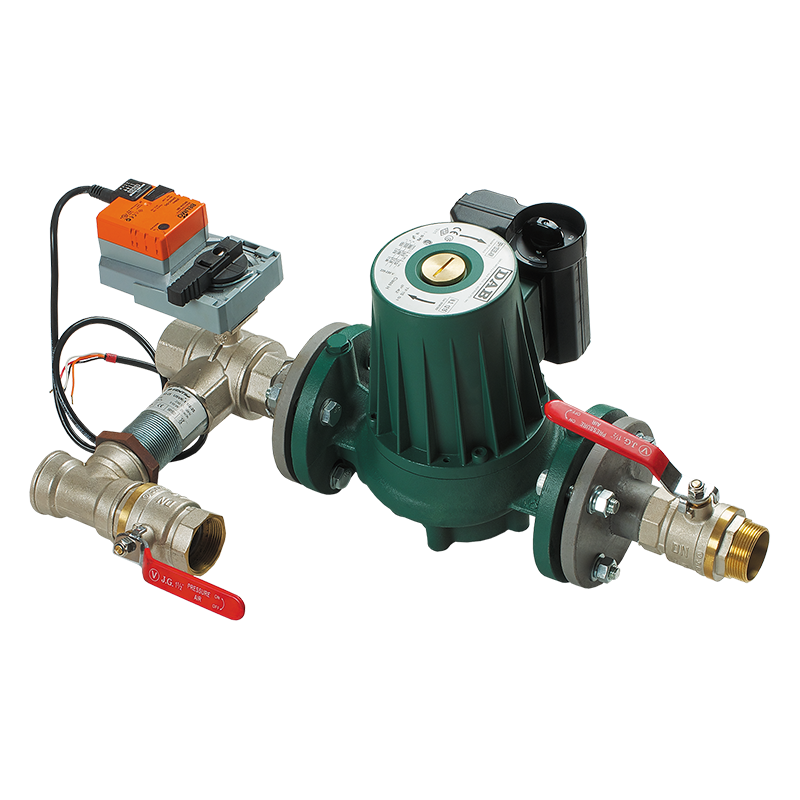 The three-way valve is designed for smooth mixing of the heat medium stream from the heating (cooling) system and the return heat medium in a required proportion to regulate the heat medium temperature supplied to the water heating or cooling coils. The three-way way is actuated with a control 0-10 V signal from the ventilation control system. The mixing unit is rated for heat medium operating pressure in the mixing set 10 bar.